Ex-Davao Mayor now President Duterte proved that the allegations of Sen. Trillanes are not true. 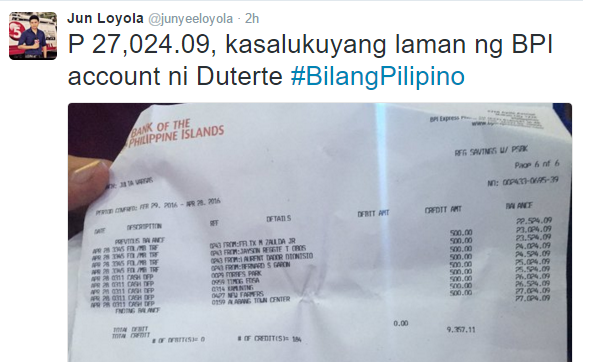 On his campaign sortie last year in Daet, Camarines Norte, the tough-talking Duterte showed to public his latest BPI bank statement of account. 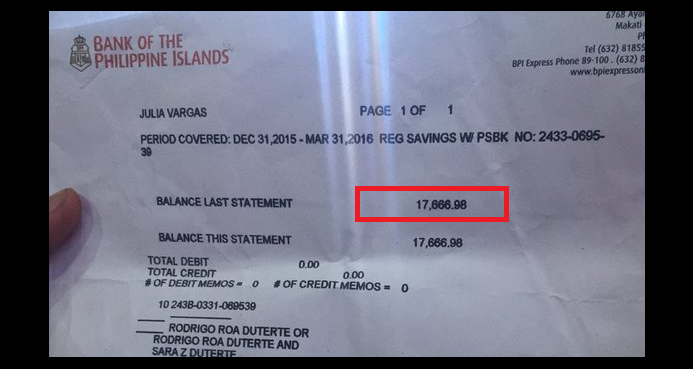 It is clearly stated on the SOA that PRRD has P17, 666.98 in his bank account covering December 31, 2015 to March 31, 2016 and the latest at P27,024.09 only contrary to what Sen. Trillanes was claiming. Futhermore, lawyer of Duterte will set a meeting with Sen. Trillanes to personally show to him the bank statement. Venue, date and time of such is yet to be announced. Meanwhile, BPI already issued their official statement about the issue. BPI said no breach on client confidentiality particularly on Mayor Rody Duterte's bank account. What is your take on the issue? Share your thoughts on the comment section below!